For our Spring Grand TUA (The University of Avacal) feast, we decided to serve a trio of butters to go with the fresh-baked bread provided by the Borealis Culinary Guild. 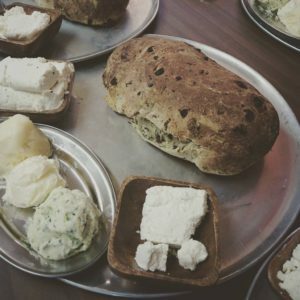 I’m not really sure what the period accuracy is of serving flavored butters with bread; however, it’s an absolute SCA staple and I think it’s just as important to acknowledge our internal customs and traditions. For variety, we served a herb butter, a whipped butter, and a honey butter. I highly recommend whipping any butter you use for a feast – not only is it easier to spread, it will increase the volume of your butter and make it stretch a little further. Two pounds of butter for each recipe handily made enough for ten tables of eight, with plenty extra to go around. Honey butter is a feast staple around here. How strong you make it depends totally on your taste and the tastes of your populace. In general, you want between 1/4 and 1/2 as much honey as you have butter. Combine all using a whisk, electric or hand. (Use a stand mixer if you’re putting together a feast – trust me.) More honey will result in a firmer texture. We adapted this recipe from Bóthæiðr’s “Scarborough Faire” butter, which was a big hit in Northshield. She recommends using a strong gouda cheese rather than the parmesan, and in a larger amount. Butter is easy to whip, and it gives your feast a much more finished air than just dropping a brick of cold butter on the table. You’ll find less will be wasted if it’s whipped, since it stretches more and people are more likely to use it up if it’s easier to spread on their bread! Please note, this will not work if you butter is still even a little bit cold. You want it almost as soft as it can be before it melts! Combine your butter and the milk or water and blend with a whisk (electric or hand) until it reaches the desired texture. If it’s not getting soft enough, try adding a little more milk. *Do not whip butter ahead of time and then pop it in the fridge! Once whipped butter gets cold, it will lose its texture and you’re back at square one.